Mark Kurlansky reads from Edible stories : a novel in 16 parts. Mark Kurlansky signs The Eastern Stars: How Baseball Changed the Dominican Town of San Pedro de Macoris. Mark Kurlansky discusses The Food of a Younger Land: A Portrait of American Food. Mark Kurlansky , The Food of a Younger Land: A Portrait of American Food--Before the National Highway System, Before Chain Restaurants, and Before Frozen Food, When the Nation's Food Was Seasonal. Mark Kurlansky is a New York Times bestselling and James A. Beard Award-winning author of a number of books, including Salt and Cod. He is the recipient of a Bon Appétit American Food and Entertaining Award for Food Writer of the Year, and the Glenfiddich Food and Drink Award for Food Book of the year, as well as a finalist for the Los Angeles Times Book Prize. Now Kurlansky takes us back to the food and eating habits of a younger America. Before the national highway system brought the country closer together; before chain restaurants imposed uniformity and low quality; and before the Frigidaire meant frozen food in mass quantities, the nation’s food was seasonal, regional, and traditional. It helped form the distinct character, attitudes, and customs of those who ate it. In the 1930s, with the country gripped by the Great Depression and millions of Americans struggling to get by, FDR created the Federal Writers’ Project under the New Deal as a make-work program for artists and authors. A number of writers, including Zora Neale Hurston, Eudora Welty, and Nelson Algren, were dispatched all across America to chronicle the eating habits, traditions, and struggles of local people. The project, called “America Eats,” was abandoned in the early 1940s because of the World War and never completed. The Food of a Younger Land unearths this forgotten literary and historical treasure and brings it to exuberant life. Mark Kurlansky’s brilliant book captures these remarkable stories, and combined with authentic recipes, anecdotes, photos, and his own musings and analysis, evokes a bygone era when Americans had never heard of fast food and the grocery superstore was a thing of the future. Kurlansky serves as a guide to this hearty and poignant look at the country’s roots. Mark Kurlansky discusses The Food of a Younger Land: The WPA's Portrait of Food in Pre-World War Ii America. Mark Kurlansky , The Last Fish Tale. Mark Kurlansky's book Ready For A Brand New Beat was available from LibraryThing Early Reviewers. 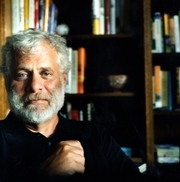 Mark Kurlansky is currently considered a "single author." If one or more works are by a distinct, homonymous authors, go ahead and split the author. Mark Kurlansky is composed of 7 names. You can examine and separate out names.